Who would be a good company to travel to the Holy Land with? Maybe a 10-12 day tour. Have anyone been there before? Did you have a great experience? I would like to maybe visit Jordan too. Let me know what you think. My husband and I have been to the Holy Land twice. We made reservations again this year, but had to cancel due to a health issue that I had. The experience is awesome and it's a trip that you will never forget. Israel is breathtaking, and we were able to walk in the footsteps of the Messiah! Their food is delicious since my husband and I love Mediterranean cuisine. The best way to travel is with a Christian group. Also at many of the religious sites, women are to have their heads, arms and legs covered. The Hasidic Jews have very strict dress codes. I hope that this answers some of your questions. We have used the Quest Travel Group out of the Atlanta area. 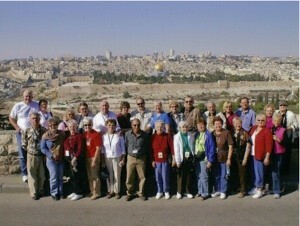 We are planning a group for March 2010 for 11 days Israel & Jordan, seeing Petra there. A night in Amman & a night at Petra, & a night on the Dead Sea, and all of Israel too. I agree with MCW - the best group to travel with is a Christian group. They will know the places you should see.